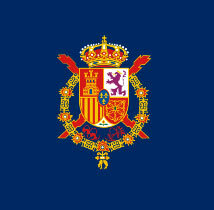 The King's standard in Spain is a square flag, dark blue field with the coat-of-arms in the middle. On his yachts, the King flies the normal yachting flag, the well bicolour flag with a blue royal crown in the centre of it. He also flies the burgee of his local sailing club ( Palma de Mallorca). Until 1931, the King ( Alfonso XIII, and before him his father Alfonso XII) always used the flag of the Spanish Federation of Nautical Clubs at the stern on the royal yacht Giralda .